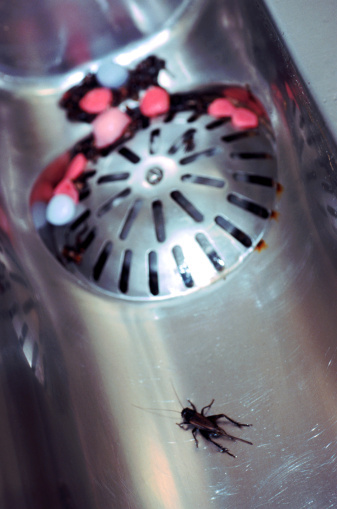 The sink drain might be the last place you expect to find ants, but plumbing areas can be enticing to the pests. Food and grease buildup inside drains and pipes attracts ants to the steady food supplies. If the crafty critters build nests in, or near, your house, providing easy access to plumbing, your pipes can be a regular hangout for ants without you even knowing it. You can get rid of ants in plumbing by cleaning drains and pipes to remove attractive conditions while controlling ants to remove the infestation. Tasty meals await ants inside a drain with food buildup. Pour 1/2 cup of baking soda down the drain where ants have been spotted. Follow the baking soda with 1/2 cup of white vinegar. 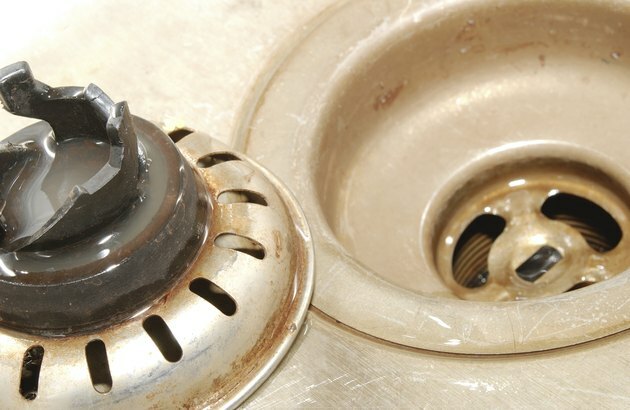 Let the solution bubble inside the drain for 10 minutes to loosen food and grease residue. Heat 1 quart of water to a boil in a cooking pot. Slowly pour the boiling water down the drain to kill ants inside and remove the substances attracting them. Kill ant nests and colonies in the walls around pipes with borax powder. Use a disposable caulking gun to pump borax into the wall by way of the space around pipes underneath the sink. Position commercial ant bait stations inside cabinets under sinks and any other enclosed area near plumbing fixtures. Replenish the bait stations with new ones as instructed by the manufacturer.